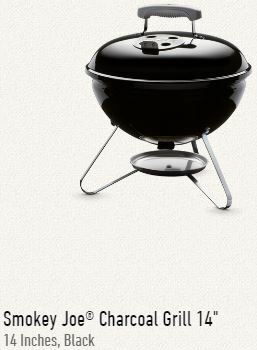 Check out our wide variety of Charcoal Grills from Big Green Egg and Weber. The Big Green Egg stands alone as the most versatile barbecue and outdoor cooking product on the market. 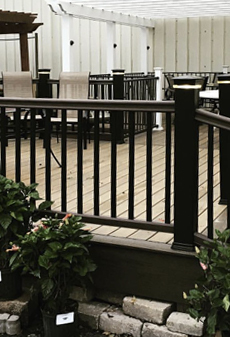 From entrees to appetizers to desserts, the BGE will exceed all your expectations. 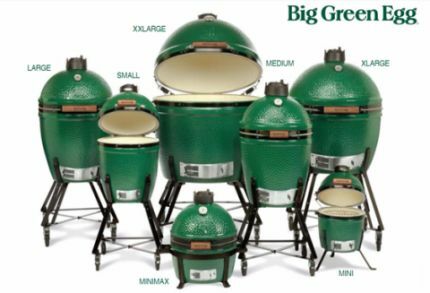 We stock six convenient sizes in stock, offering a Big Green Egg to fit any need and lifestyle. 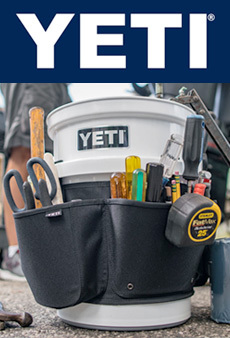 We also stock the full line of Weber charcoal grills, from the portable Smokey Joe for your tailgate party, to the Original Kettle and Performer and the Smokey Mountain Smoker, to the top-of-the-line Summit Charcoal Grilling Center. After a busy week, let the world of the charcoal grill bring you back to basics and the original experience of cooking over an open fire. 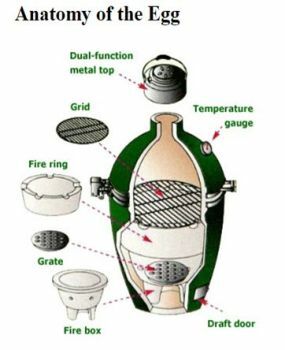 Big Green Egg is the world’s largest producer of the highest-quality ceramic kamado-style charcoal grill. When you buy an EGG, you know your investment is protected by a successful, experienced company with a worldwide reputation for best-in-class products and unmatched customer service. They provide you with confidence, knowing that they have been standing behind their products for over four decades! 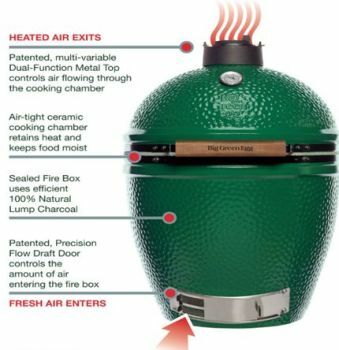 As Big Green Egg has evolved over the years, significant changes have been made to keep it miles ahead of anything else on the market – state-of-the-art ceramics, a wide range of easily adjusted cooking temperatures, a stainless steel cooking grid, and a permanent porcelain glaze to preserve its signature green color. 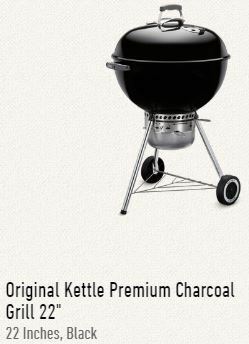 The Original Kettle: Immerse yourself in the sound of crackling briquettes and aroma of rich smoke. Stay true to the modern version of the kettle that started it all -- the Original Kettle. 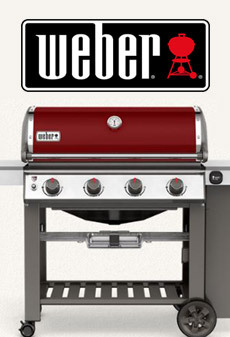 Invented by Weber's founder, George Stephen, and loved around the world. So call a few friends, relax around the grill, and take it all in. This is the essence of charcoal grilling. The Master Touch: The menu has been planned and the details considered. 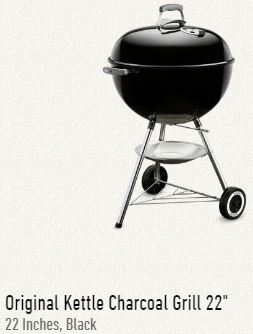 It's time to light the briquettes, pour drinks, and anticipate the sound of sizzling meat placed on a hot cooking grate. 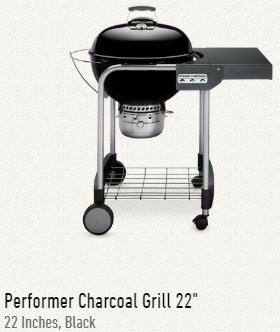 The ritual of charcoal grilling meets the innovative features and wow factor of the Master-Touch charcoal grill. A yard full of friends, tables loaded with food and music with the essence of barbecue sharing the air. 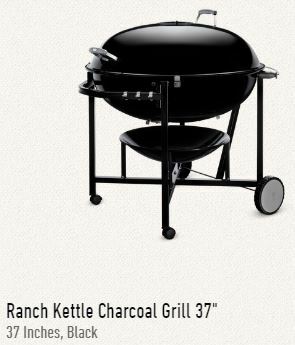 The enormous capacity of the Ranch Kettle charcoal grill sets the tone for a party that lasts until tomorrow. 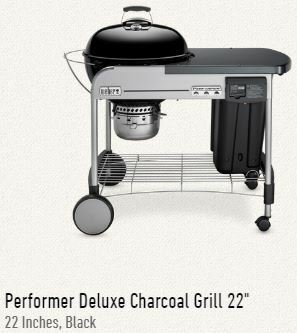 The Performer charcoal grill comes equipped with Gourmet BBQ System cooking grates. The Gourmet BBQ System takes grilling to a new level. Unique inserts (sold separately0 expand cooking possibilities by delivering professionally seared steaks and chops on the sear grate, delicious breakfast in the griddle, spicy stir-fry and soups in the wok, and even crispy pizza on the cordierite pizza stone. 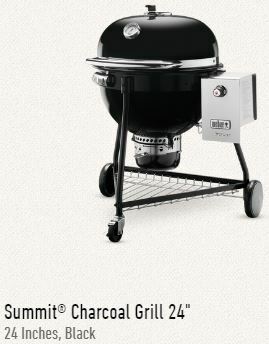 This system delivers the ultimate experience for grilling fanatics! 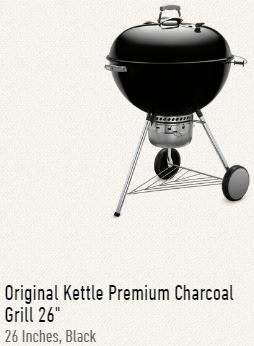 The Charcoal Summit: Experience the evolution of the iconic Kettle where charcoal grilling meets low-and-slow smiling. With a push of a button, coals are lit and the smell of barbecue will soon embrace the neighborhood. 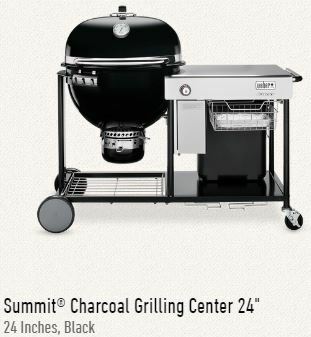 Whether smoking, grilling, or even better, baking, the Summit Charcoal Grill is the answer to any craving and the ultimate backyard kitchen. The Smokey Joe - Let nature set the scene as crisp air bites your cheeks. Complete serenity, with only the crackle of charcoal breaking the silence. Once you grab the handle of your Smokey Joe or Jumbo Joe portable charcoal grill, the opportunity for adventure is endless. 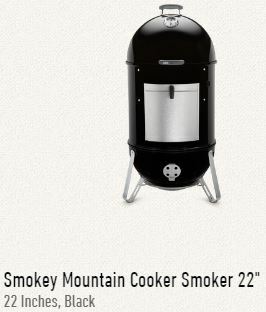 The Smokey Mountain Cooker - Once your taste for smoke has developed, the next step is the Smokey Mountain Cooker. Weber's smokers are designed to cook food over an extended period of time -- a method that has become well known for classics such as pulled pork and ribs. cooking "low and slow" keeps the juices and flavor in your food that will eventually produce an extremely tender piece of meat.